y'all have me clustered with a fantabulous friday freebie and your love has lifted me! Wishing to thank y'all for the love. I read every comment and personally reply to them! It really does make me feel so much more connected to y'all when I can answer your questions or let you know how much your comment has meant to me! You are also very encouraging and inspiring! I do have one request before leaving you with this week's FFF. I don't always talk directly about what is heavy on my heart, but today, I feel compelled to as I know the tight-knit community we have here in Scrapland and that so many of us know someone who has been affected by cancer in some form or fashion. Connie is still so full of optimism and hope. She is a fighter! My precious brother, having to take time away from his job to care for Connie, is tired, weary and emotionally drained. I can only imagine. I've had the honor and pleasure of meeting both my brother, Todd and his wife, Connie, face-to-face only one time (long story), yet I feel as though I've known them a lifetime. They are, both, embedded deep within my heart. I love them both individually and collectively. They are truly an inspiration and are amazing models as to the kind of love we would all hope to experience with our partners throughout our lifetimes. Todd and Connie, both, have incredible faith. Todd's lastest update let us know that they are home and that Connie is resting comfortably and in good spirits. They know they are in God's hands and taking things one step at a time. Please, keep them both in your thoughts and/or prayers. They have an incredible support system and it can never hurt to have a little more positive energy coming your way in a time of need. Thank you all for being you. I have met some of the most wonderful, dear, loving and kindhearted people here in Scrapland. My extended family. My home away from home. happy everyday y'all and a freebie too! I so meant to have a small gift for you yesterday, however, my imagination got the best of me! 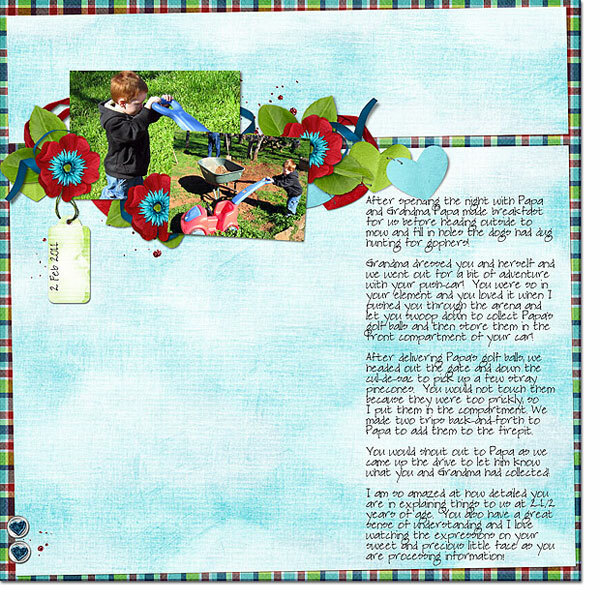 I had in mind what I was going to give you and then "out of the blue", I changed it up after beginning to scrap a layout of my grandson from his adventure at our house this past weekend! Jace, now 2-1/2, spent the night with us for the second time Friday night. He is just pure joy! Such a happy boy and soaking everything up like a sponge! I love the way Jace goes into detail when explaining things. For example, he was telling Grandma about how the owl flies in the sky above and looks down at him. Watches him. Last visit, he was explaining to me in detail, step-by-step, how Daddy prepares a burrito in the microwave! OMGosh! Too cute and blows me away! I hope you like the scrapatit. If you think you might like the photo cluster as seen at the top, leave me a comment and if enough of you are interested, I will offer it up later this week! Hope everyone had a wonderful day yesterday. We celebrate Valentine's Day everyday, but I do still like to do something special for y'all as a reminder of how thankful I am for you and how much I appreciate your love and support! I awoke this morning to the sweet voice of my sweetheart jubilantly declaring, "happy everyday"! Life is good y'all and I wish y'all a happy everyday too! As of 12:00 pm PST, when Linky automatically closed, there were a total of 19 layouts to select from. I submitted the numbers above to the Random. 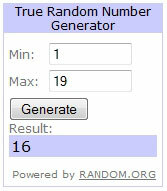 org generator and the lucky winner of the $10 gift certificate to the scrapbooking store of her choice is entry #16, jrainj! Now that the pool has been broken in, please don't be shy in jumping in whenever you wish to! Seeing you work with my designs is encouraging and helps to keep my creative juices flowing! I plan on randomly selecting a layout every month and I will follow up with details by the first week in March. So, get your scrap on! Wishing you all a very sweet day with your loved ones today ... and every day! I will be posting a little something for all of you a little later on today to show my thanks and appreciation for your continued love and support - MWAH! "mozying" around and a fantabulous friday freebie! Wishing for my own car. Hoping for my own car. Believing I now have my own car because I am sitting in it! My youngest twin son, John, sitting in his new Honda that, believe it or not, ran for one week before blowing a head gasket! That beautiful smile turned upside down real quick ... poor babe! Hope your week has gone smoothly! I've already come upon a few more obstacles in mine, but they will be overcome soon! ROFL! What now, you might be asking? Well, I was 'mozying' around, minding my own business in Photoshop, when I was repeatedly distracted by the fact that my main drive was running out of room. I made brief mention of this on my February 1st blog post. Any one else reading today use Mozy to back up your files online? Or did? As of this past week, I have removed my rave review from the bottom of my blog and I am working on relocating my files to a new home that will continue to provide unlimited back up and I can even opt to use them as online storage, which means if I need to free up room on my computer or my EHDs, I can do so and my files will stay on their online server. Who am I referring to? Livedrive! After finding quite a bit of chatter on Facebook and at Digi Shop Talk about the changes at Mozy, as well as the email most of us using them have received, I realized that they are no longer an option for me. Way too expensive with their new price structure. Ugh! My Mozy software has been updated twice since the end of December. The first time, I noticed that the back up process was starting all over again and the files were being handled differently. While I am not exactly sure why I am missing huge chunks of space on my main drive, I do know that since Mozy's changes, I have had issues with other programs acting a little wonky. Without going on and on about this, I am simply going to start backing up to Livedrive starting on Valentine's Day (nice gift of love to myself!) so that I won't be billed until the first of March (Mozy is paid up until then), as they offer a 14-day trial. Livedrive does not ask for any credit card information up front. I like them a lot for this alone, as it does not make you feel like you are committed and then you need to be concerned about canceling, if you should decide to do so, within the 14-day trial period. I checked into another recommended back up service, however, they charge per computer. Livedrive allows you unlimited computers, unlimited backup, unlimited storage (if you choose Briefcase) and unlimited bandwidth. If you are interested, just give them a good look over and you will see all that they offer and the difference between them and your typical online back up service. Hope this is useful information to someone out there! Just a side note on the price difference for me between Mozy and Livedrive. I can subscribe to both Livedrive's Backup and Briefcase services for less per month than what Mozy wishes to charge me for under 200 gigs of back up alone! Woot! 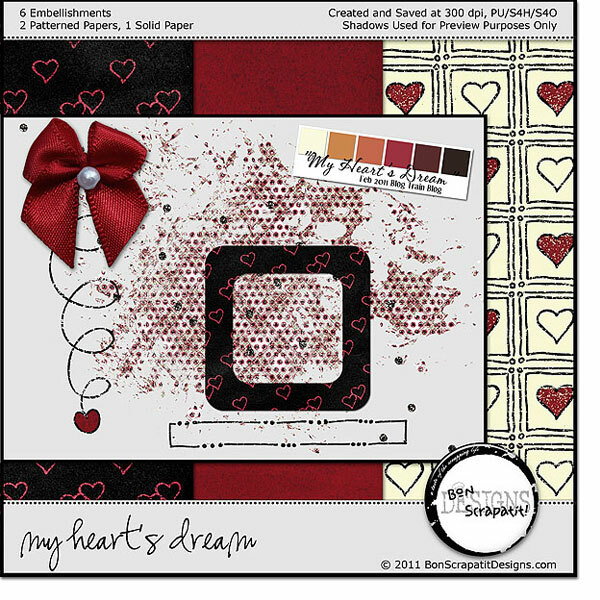 A quick reminder that Monday, Valentine's Day at 12:00 pm PST is the deadline to upload your layout(s) to the Bon Scrapatit Designs Flickr pool (link is located at the top of my blog), using any of my designs, for a chance to win a $10 gift certificate to the digital scrapbooking store of your choice! Have a gorgeous weekend everyone and remember ... it is scrap-happy hour in Scrapland 24/7! give away of the day ... check this out y'all! Dropping in for a really quick post and hoping to beat my feedburner so y'all see this! This is the first time I have actually taken the time to reach you all to grab a piece of really cool and free software from Give Away of the Day. I was just mentioning to Robert about wishing to keep a journal of some important things that have transpired the past week or so and I found this in my inbox a little bit ago. Smart Diary Suite, Medical Edition retails for $69.95 and is free for the downloading until 11:59 pm PST tonight. If you have never downloaded from GAOTD before, you must unzip, install and register the program (text file includes all needed info) before midnight of the giveaway day. Check it out and see what you think. I think this will be a very useful tool for my scrapbooking, as well as some other very cool things. You can even add audio clips. Can't wait to give this a test run! Enjoy the rest of your weekend and I'll see you back tomorrow with a few layout shares and a freebie! link your layouts here for a chance to win a 10 dollar GC! 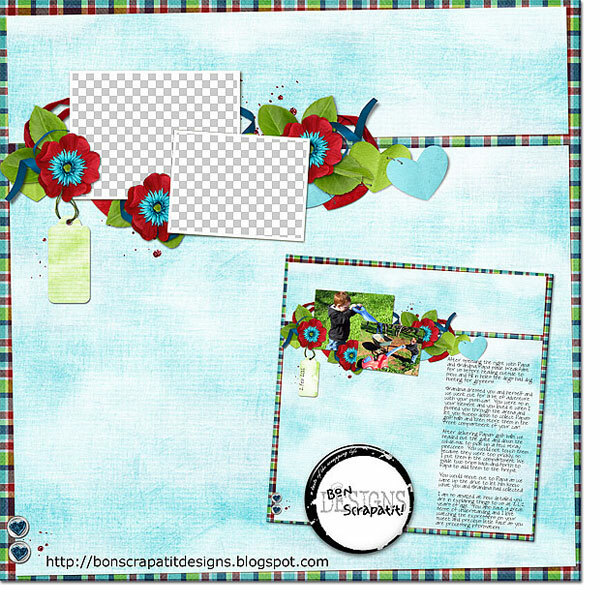 Here is the specially created post for you to link your layouts to from the Bon Scrapatit Designs Flickr pool! I found a nifty little script on a blog hop several weeks back and I am posting a little tutorial for you to help make it a little easier (I hope) for you to figure out if you've not yet used Linky! I am loving it. It will show your images as well as assign a number to each entry! So cool! You must use pieces from either *Warm Winter Wishes* or from the *Friends. Dreams. Memories. * kit, which are both free here on my blog. 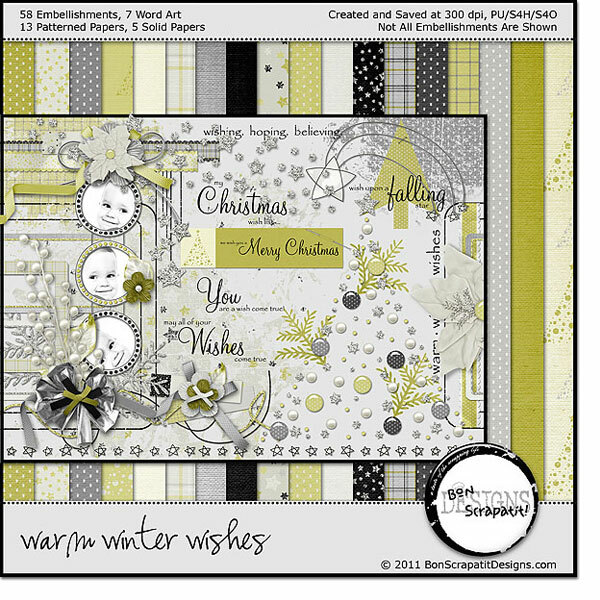 UPDATE - you may use designs from any of my kits and/or freebies found here on my blog! Sorry. I had intended to state it this way in the beginning and just thought it might be easier for those that are new and/or have not had a chance to download other kits if I limited it to the last two. Please feel free to use any of my blog train goodies as well! Bon Scrapatit! Have fun and get your scrap on! Deadline for posting layouts to the group pool and linking back here is 12:00 pm PST on Valentine's Day, February 14th! If you have any questions, please leave a comment in this post and I will reply to it right here just as quickly as I am able to. Hi y'all! Just a quick note to let any of you who might have received an email from me from my Yahoo mail address: bobbysgirlforever2000 know that I was spammed or hacked the wee hours of this morning. I seldom check my Yahoo mail as I only use it for my digital scrapbooking store accounts and some designer newsletters. I've had this account for six years and have never had an issue until today. Apparently, I am not the only one, so I just wish everyone who might read this and/or received an email from me via Yahoo, that I did not send an email out! I will never send an email out to anyone from my Yahoo account unless it is in reply to a mail sent to me there. I have several Gmail accounts and my personal email account with my local ISP. Most of you that frequent my blog are familiar with either bobbysgirlforever2001 (at) gmail (dot) com or bonscrapatitdesigns (at) gmail (dot) com. I don't use my personal account for business, although it is attached to my Facebook account. Anyhoo, sorry for any inconvenience if you were affected. I am pretty good about sensing a spam mail and I simply delete them and pay it no mind as I know these things do happen. Thank you to the few of you that contacted me and brought it to my attention. I truly would have been none-the-wiser since I've not logged into Yahoo for well over a month! I have changed my password and applied a security seal so, hopefully, it will be virtually impossible for this to happen again. I hope! 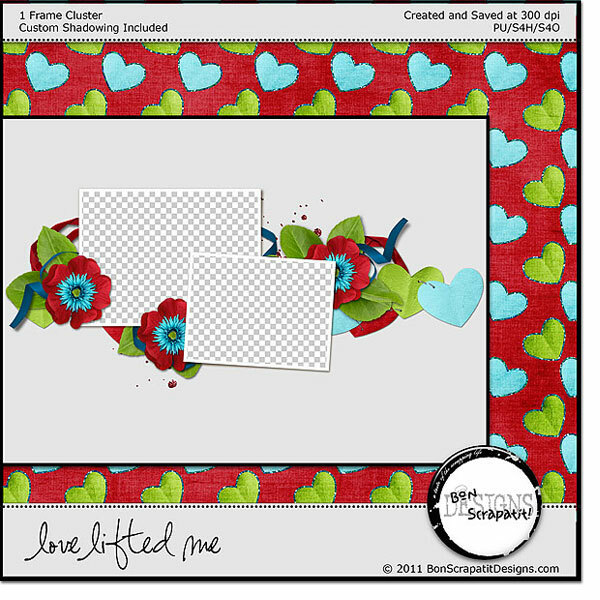 I'll be back in the morning with a special post for y'all to leave the links to your layouts in the Bon Scrapatit Designs Flickr pool for a chance to win a $10.00 gift certificate, which will be randomly selected on Valentine's Day! Hope y'all are "feelin' scrappy" (to the tune of Feelin' Groovy") ... MWAH! my heart's dream ... february 2011 blog train has arrived! Here is a lovely slide show with previews from 101 contributing designers this month! 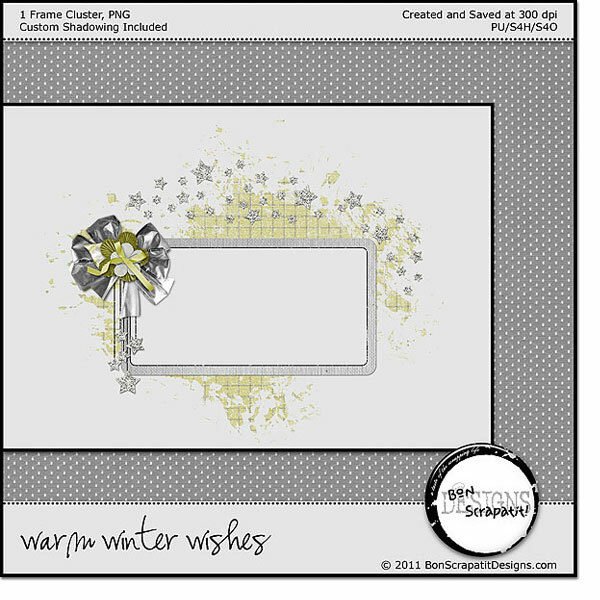 If you've not already seen it, scroll down one post for my free scrapkit, *Warm Winter Wishes* and a chance to win a $10 gift certificate to the digital scrapbooking store of your choice! "warm winter wishes" for y'all and details for the chance to win a 10 dollar gc! I am posting later than I had anticipated, but I'm here! Phew, a crazy day for sure with nonstop interruptions and a computer that was not cooperating through no fault of it's own! I've been missing big chunks of space on my C drive and finally came to the conclusion that it is Mozy backing up my mega-gigs of files, so I finally stopped it so I could get things finished up for y'all! I have been checking in several times throughout the day to see if any one is having issues, so please do not hesitate to flag me down if you do! 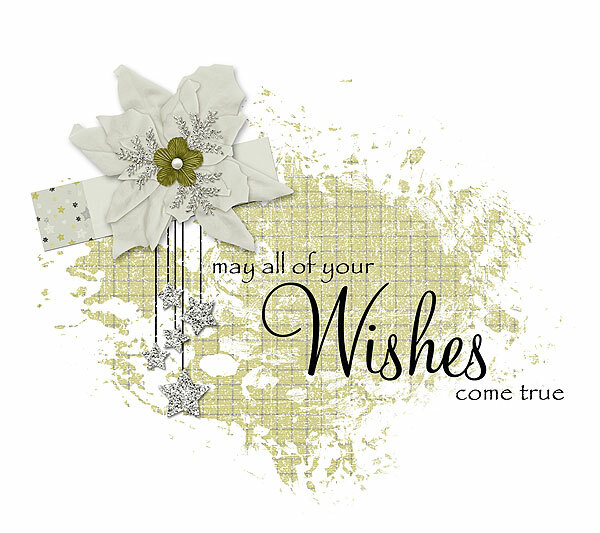 Before I post the links for *Warm Winter Wishes*, I am going to give you the scoop on how you can win a $10 gift certificate to any digital scrapbooking store of your choice! Winner(s) must be sure to check to make sure the store of their choice offers gift certificates. I recently started a Flickr group for Bon Scrapatit Designs. It's been quite some time since I've had the pleasure of viewing layouts using my scrapkits, so I thought the Flickr group would be a nice way for you to share your masterpieces with me, as well as others who visit Bon Scrapatit Designs and/or Flickr! 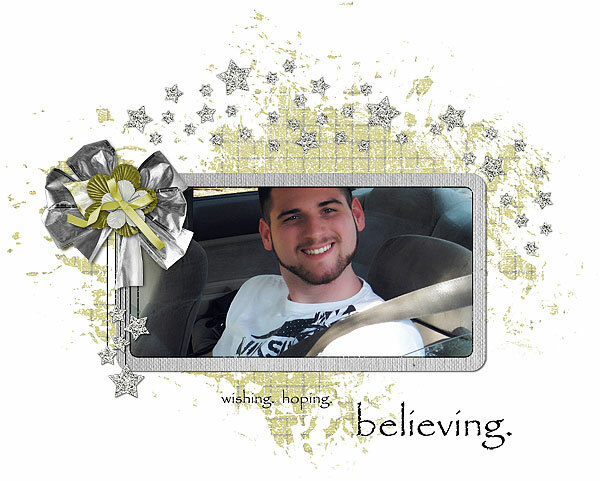 Honestly, there is no greater reward in digital scrapbook designing than to see your creations used to preserve memories. It is both uplifting and encouraging! If the response is good, I just might add one or two more gift certificates for $5 each! You must use pieces from either the kit you download today, *Warm Winter Wishes* or from the *Friends. Dreams. Memories. * kit, which is still available for download on the side bar if you've not already done so. I am looking forward to seeing what y'all create and I will leave some love on each layout uploaded! If I've forgotten anything, I will add to post I create for you to add your links to. I will also list the rules and deadline information at the top of new post. Thank you so much everyone for visiting, for your support, for your wonderful and witty comments and for making memories with me!